Having completed an intensive wine-drinking training schedule over the past four weeks, today we carried our battle to the enemy with a direct assault on the European Wine Lake in its very heartland. We were roused at 4:45 AM for our planned 5:45 AM departure and (hopefully) two hour drive in the personnel carrier to Folkestone where we were to board Le Shuttle for the 8:50 AM crossing. We were keen for Keith to see the train technology used in the Channel Tunnel. After a slightly delayed but very smooth 35 minute trip we took the enemy by surprise, stealthily emerging from the tunnel behind their defensive lines which were still positioned to guard the beaches against an expected seaborne invasion. We scampered on to the autoroute and were swiftly off towards Normandy to establish our New Year beach head. Carol and I have always wanted to see Honfleur, by reputation a picturesque old harbour on the south of the estuary from Le Havre (by reputation, everything but picturesque). 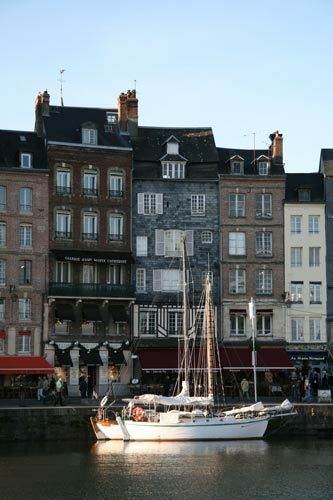 Today provided the perfect opportunity since our route to Dives-sur-Mer in Normandy would take us right by Honfleur. After about two hours driving, we pulled off the autoroute and broke our journey there for a seafood lunch followed by a stroll around the harbour enjoying the sites and aiding the digestion. Then it was back to the transport and on down the coast road for about another hour to find our accommodation. Our directions to our quarters had been written for a different flight path so, in consequence, we made one or two wrong turns before eventually finding a pleasant billet in Dives-sur-Mer just as light was fading. We were stationed in Port Guillaume, named after William the Conqueror who set sail from there in 1066 to invade England. Though his invasion technically succeeded, I can’t help but wish that he had done a more thorough job of instilling in the Angles the same passion for all things culinary that is so central to the lives of all Frenchmen. Nice try Guillaume – some of us are disciples to the cause and appreciate your efforts. We fought our way through several heavily guarded entrance barriers using a combination of codes and keys to find the apartment. Having retrieved a special electronic device secreted by the French underground, we were then able to open a further two barriers and gain access to the underground parking area where our car would be safe from aerial attack by any cruising enemy seagulls. We completed the unloading operations and fought our way through further staunch resistance back upstairs to the apartment. 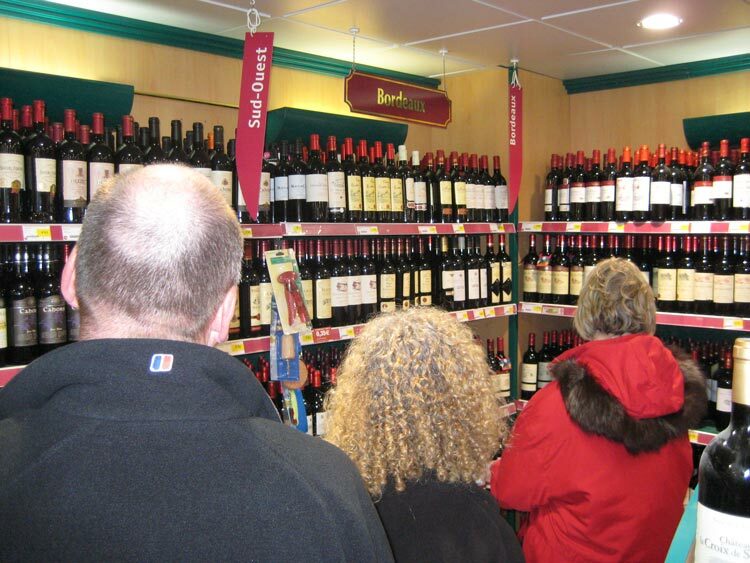 Finally, we could leave to reconnoiter the local supermarché for evening provisions and to make an initial withering assault on the wine lake. Allied Invasion Force Four was off to a grand start.